Prominent & Leading Manufacturer from Mumbai, we offer wire harnesses. We are one of the leading manufacturers of Wire Harnesses. The harness is a bunch of wires which are tied to the cables or places in sleeves for putting ready into sleeves, after which they are ready to connect to multiple places with clips, connectors. So electrical wire harness can be fitted to the end of the wires. 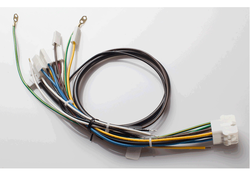 Our auto wire harness is designed to perform under extreme conditions with uninterrupted services and can sustain heavy loads. Our wire harnesses are manufactured as per customer specifications and in compliance with international quality & safety standards. Automobile wiring harness like Bus wiring harness, truck wiring harness along with wiring harnesses for four/two-wheelers. Elevators harness for lifts for the multistoried building as per the specifications of the elevator manufacturers. Harnesses for home appliances like refrigerators, televisions etc. Chilling plants: Electrical wire harness is extensively used in chilling plants.